With the delights and demands of work and time spent away from home this summer, it has come as no surprise that I am not at all ready for the planned distance hike I am doing this month. So time to get the boots dubbed and waterproofs nik-waxed, find my tin cup and get the expedition tent out of moth balls. Some of you may already know, I received a call on the evening of the 13th of May a call we all dread to get, the call that someone you love is in hospital fighting for their life due to an accident. When we first heard that my brother-in-law had been involved in an RTA whilst on his motorbike there was a lot of swearing, second guessing, jumping in cars and heading through the night to Nottinghamshire and that he was possibly driving without care (though that isn’t his style – not on a bike at least). Rushing to the QMC in Nottingham it unfolded that he was in fact the victim of the reckless act of careless driving, a driver had lost control and ran him over whilst he was stationary in traffic on his new Ducati motorcycle. As my wife stared down at her oldest brother, whilst hooked up to every machine the NHS have at their disposal, saying to the Medical Team and Police that yes this was indeed her brother Karl. A terrifying situation and one she was unsure of what would happen next, distraught at the thought of him seeing this hunk of metal coming at him at speed and unable to do anything about it, and the horror and the colossal pain he must have felt. He was unable to breathe on his own, with two punctured lungs, two broken legs, lacerated spleen & liver, broken elbow, wrist, collar bones, shoulder blade, nose, numerous ribs and untold brain damage, the prognosis did not appear good. The important thing though was that he was there, in hospital, receiving treatment quickly because of the actions of the Lincolnshire & Nottinghamshire Air Ambulance Team (LNAA) – had they not been there to assist in his immediate and essential care, he most definitely would not be lying on the bed getting amazing 24 hour care from the team at QMC in Nottingham. As the weeks went on we saw Karl progressively get better. From the first breath he took independently – which was as wonderous as watching our own children breathe for the first time, to the first squeeze of a hand, then onto the opening of eyes, the first look of recognition even though he couldn’t speak and then onto the random stream of words and slowly moving to organised speech, if only to be filled with profanity that would make a Merchant Seaman blush (but who can blame him?). The most special of days came when out of the blue on a visit he saw Rebecca, clung on to her and said how much he had missed her, asked about the children by name and asked where I was. I can’t describe the relief and joy after skype-ing Rebecca that evening from her Hotel room, he was going to be OK.
Nearly 4 months have passed and he is moving himself about in his wheel chair, working on walking independently (with a frame at the moment) and is nearly his old self again-just the memory of a preoccupied goldfish to sort out. 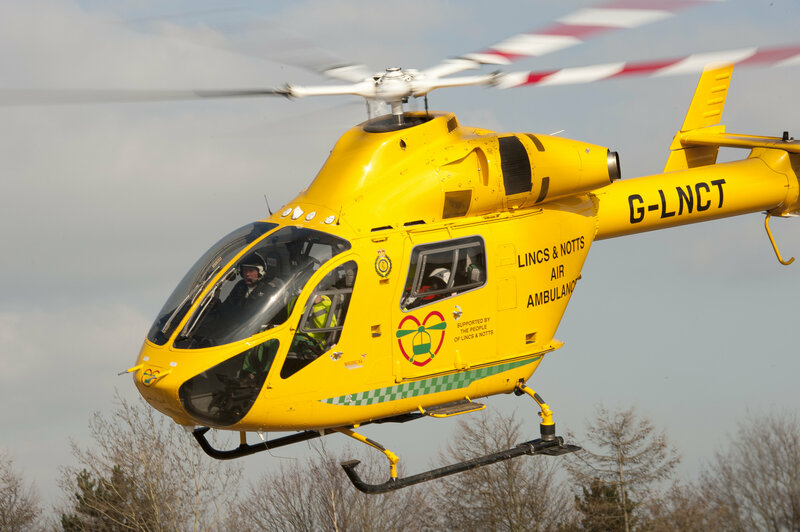 Now that he is out of the woods, so to speak and proving to us the wonder of medical science, the amazing staff at Lincs&Notts Air Ambulance, the diligence and phenomenal bedside care of the nurses and surgeons of QMC; and human spirit, it is time for us to give back. It comes as no surprise that it costs to get this Helicopter up and saving lives, £3000 every time the air ambulance gets that call. With this in mind we’d like to raise as much as we can towards that figure so that others can be saved by such an unparalleled and selfless service. 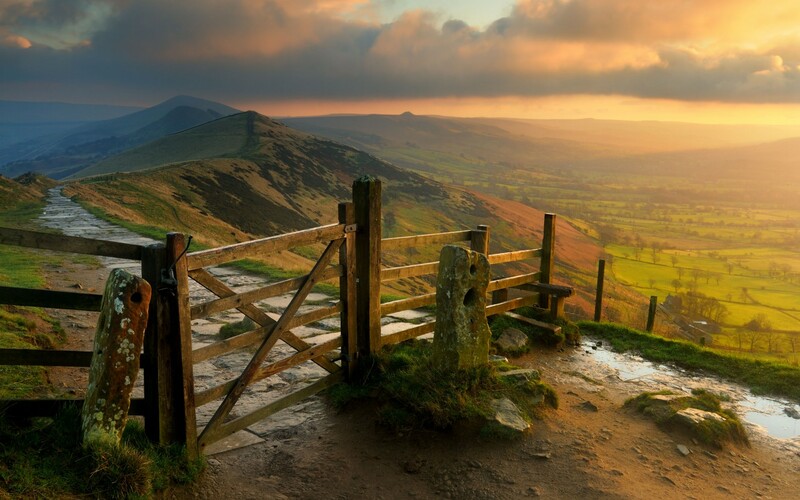 Rebecca and I are undertaking a long distance challenge walk taking in the Derbyshire Peak District. 60 miles in 4 days (yes, that’s 60 miles) up hill and down dale, fording rivers and scrambling over scree; this is going to be a major undertaking as I am not as fit as I used to be, in fact if I were a horse, I’d be gluing your Sneekers by now; for Rebecca the challenge will be how to move past the ice cream shops and to not fall asleep in the stone circles. This is not subject to the stunning weather we have had this summer, (discounting today’s floods and possible thunder storms) we have been honed from years of dashing up Mountains and carved from decades of rain strewn fells to let a little August rain hamper our progress. If however you’d rather forgo the blisters and join us on a leg or two, map reading or just getting eaten alive by midges, please donate what you can to this great cause, anything you can give would be highly appreciated. We have received in the past three weeks an amazing amount of money, with only 23 donations we have almost hit the £600 mark. Such generosity is moving and inspiring in equal measures. This accident was the act of carelessness, and has resulted in a long and worrisome time for my family – wrong place, wrong time. It could happen to anyone and knowing a service is out there that can make the difference between life and death is certainly one that we should all support. So if this valiant yet small gesture can raise enough to cover the cost of the life saving act back in May, we can all be rest assured that all of these services can keep flying. Please CLICK HERE thank you.